MAG Ireland’s inaugural “On the Road” Rally takes place in Kilcogey, Co. Cavan on the weekend of 5th and 6th of July, and we will be hosting a contingent from MAG UK who are celebrating the 40th anniversary of that organisation. Nutt Travel have stepped up with an exclusive offer for all UK visitors attending this event with fares for bike and rider just £69 return. To book, call Nutt Travel on 02870 351199, email info@nutttravel.com or click on the poster below to get the ball rolling! Travel must be between 3 July 2013 – 8 July 2013 (Inclusive) on the 3 routes shown on the poster. Bookings made within 8 weeks of departure must be paid in full at time of booking. 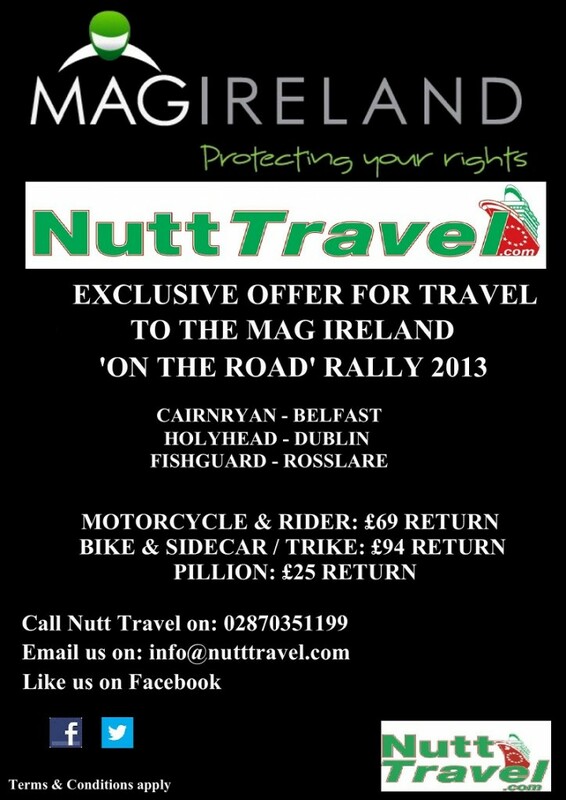 For more information on MAG Ireland’s inaugural “On the Road” Rally, click the banner below. We in MAG Ireland extend our thanks to MAG UK and the staff in Nutt Travel for their assistance in bringing this offer to you.